Put your trust in the authority for preventive medicine. Because of our affiliation with Mount Sinai/Beth Israel we are able to call upon any medical specialty our patients require in health care. A mere phone call can achieve what most physicians and consumers would take a month to accomplish. Inner Imaging is the only dedicated preventive center in New York State. We serve the needs of over 600,000, New Yorkers and over 200 unions. We detect 105 diseases and have confirmed 11 forms of cancer to help save lives. At Inner Imaging we can detect some diseases up to two decades before symptoms occur. Give yourself the advantage of our fast, accurate & painless screening. One in 31 women die of Breast Cancer, while one in 3 women die of Heart Disease. This is a national tragedy, and one that is preventable in a high percentage of cases. For women in their 30s, 40s and 50s, it can seem as though a heart attack "comes from nowhere", but this is rarely the case. 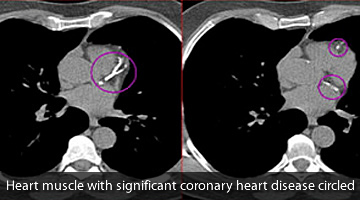 Inner Imaging can detect signs of coronary artery disease long before other forms of testing can by as much as twenty years!